Napili Shores Resort - 1 Bedroom Remodeled & Gorgeous! A/C Option Available! Come get away to the island of Maui and to Napili Shores Resort. Both of our upstairs one bedroom units have recently been extensively remodeled. From the lanai of F-250 you can enjoy a partial view of the ocean and the island of Moloka'i (winter months only) and our unit F-246 has a garden view. (Please check our ad #690654 for additional availability.) Each well appointed condo has a master bedroom, living room, bathroom, full kitchen, and dining area. Sleeps four comfortably. Units are strictly NON SMOKING properties. The units are fully-equipped to meet your every need (bathing suits not included! :o)) and local telephone calls and high speed internet are FREE. There is a queen-size bed in the master bedroom along with a new queen sleeper/sofa in the living area. If after viewing all the pictures at the bottom of this ad, you desire to see additional pictures, click on the link below to see more pictures of the units and the resort. From Napili Shores you can easily enjoy spectacular sunsets, a view of the ocean, excursions to tide pools, and all of these are just steps away from the condos. 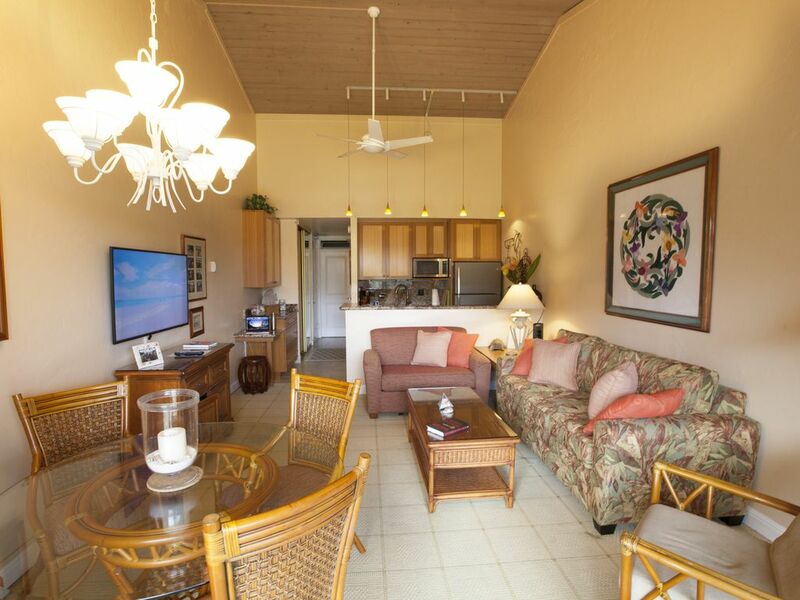 The lanai overlooks lush tropical grounds with plenty of green grass for children to play. Seasonally, whales can be frequently seen breaching as you watch from the lower pool and Napili Beach! Napili Shores is an oceanfront resort that is located adjacent to the beautiful white sands of Napili Bay in West Maui. The beach is just a short walk along an oceanfront path and is great for sunning, swimming and snorkeling. Also, within walking distance there is great snorkeling at Honokeanea Cove (Turtle Bay), and Kapalua Bay. Kapalua Bay is a 10 minute walk and is ranked in the top 10 beaches in the world. Golf and tennis are available at the Kapalua Resort just a short walk or drive to the north. Lahaina and Ka'anapali are a short distance away for your shopping and dining pleasure. The restaurants in the area are abundant, as is the relaxed atmosphere and friendly people. The well known, Gazebo Restaurant is one of two restaurants on property. The other restaurant is Kitchen 5315 and has recently opened. You can enjoy a beautiful oceanfront view from your table & savor the macadamia nut pancakes. So, if the Hawaiian Islands are your destination, come join us in Maui! We would love to have you as our guests! After living both in the US and abroad, we settled in Colorado. We love our lifestyle here, but missed the beach. So, trying to have the best of both worlds, we purchased our properties on Maui at Napili Shores Resort. When the time comes to retire, we hope to spend many more days having fun under the sun! After honeymooning in Maui and repeated trips back to this beautiful island with our family, we decided to invest in a property in Napili Shores Resort. Napili Shores Resort provided the best family atmosphere of all the resorts we visited and we always felt like we were coming home when we stayed here. We love the lushness of the property, how close it is to Napili Beach (it's about 140 steps from your front door), no high rise apartments nearby and the friendliness of the staff. It's relaxing to sit on our lanai and look out toward the ocean and Mo'lokai. The sunsets are beautiful! Love having two restaurants on property, especially, The Gazebo. The macadamia nut pancakes are great! The resort itself is nicely situated when it comes to shopping, restaurants, exploring and watching the whales from the 'wall' next to the Gazebo. Both of our units have been completed remodeled. They don't feel like you are staying in a hotel suite, but a home. When we travel, we like being able to walk into our accommodations and be greeted by warmth and comfort, not a generic property that feels like every other one that you typically get when you rent from a resort. Now that we have air conditioning, your stay has become even more enjoyable. A majority of our guests are repeat guests, give us a try, I think you'll like what we have to offer! Aloha! View from lanai of the ocean and Moloka'i. Garden view from interior of unit. Full fledged a/c that serves the entire unit. This is not a portable unit, but built-in. One of the first to have a/c in Napili Shores Resort! ***There is an additional nightly charge for a/c. Located in the community laundry room. GE appliances, granite counter tops, bamboo cabinets. Indoor and lanai dining areas. New LCD flat screen TV. (2) Upper pool is heated year round. iPod/iPhone Docking Station/Stereo, 2 Restaurants, Laundry facilities on site, Ceiling fans, Air Conditioning, Coffee maker, Ironing board & Iron, Hair Dryer, both units are strictly NON SMOKING UNITS. Lovely condo. Kitchen was well stocked. Finishes and decor were lovely — updated and still felt like Hawaii. I’d stay here again any time! Awesome place with everything needed. We truly enjoyed it. Quiet, yet one step to the beach. excellent correspondence with the host. Nice view from the lanai. Well equipped unit with good beds. Would definitely come back again. We love Napili Shores. The condo is in great condition. The two pools are well maintained. There are beautiful views and plumeria trees. The Gazebo restaurant is our favorite. Beach chairs, towels and cooler came in handy. Unit F250 is impressive . Excellent!! Very clean with new upgrades throughout. Very comfortable beds, sofa and chairs. We were there a week and enjoyed all of Maui. We have stayed and enjoyed Napili Shores before. But this unit was most impressive. We highly recommend it! Renovated and very well appointed unit. The owner was professional and prompt. But...Napili Shores is a quiet complex at Napili Bay, think, sounds of birds, the ocean and rustling palms and smell of plumeria, not the sounds of construction equipment and smell of asphalt and diesel. Unfortunately, the adjacent resort, Napili Surf is undergoing a major remodeling and construction project. So, our daytime hours were marred by these disturbances. No fault of the owner, other than not being alerted to the situation that has been ongoing for the past 11 months. We put a high value on the serenity we experienced on our previous stays at Napili Shores. Missed that...felt a little jilted. Before you "Book It Now" and/or want to send a deposit, please contact me first. I try to book reservations back-to-back where guests arrive in the afternoon of the morning other guests depart. If a guest chooses dates that are not back-to-back, then I like to leave seven nights in between bookings, as this is the most request length of stay requested. Please send an email to me with any questions before booking as it will be necessary to confirm that the dates you desire work well with my calendar. I have a variable deposit schedule based on the rate at the time of booking if paying by check. I will let you know in writing what deposit is required and what and when the balance is due. Daily base rate for 2019 start at $225 and go to $265 USD plus tax and $250 security deposit. All rates quoted depend on unit selected and payment made by cash/check. Payment made via credit cards will be higher. Do not rely on the automated quotable rate, only the amount I send directly to you. There is the option of air conditioning with an additional cost. Please contact for rates. Six month Christmas cancellation policy applies. All rates subject to 14.417% tax. There is an additional $150 cleaning fee, plus tax. There is a $75 registration fee (2019) paid separately to the front desk upon arrival to the resort. $250 security deposit required. Tax ID #W30281982-01 Payment is accepted in the quoted currency (USD$) unless the currency and the amount is specifically agreed in advance with the manager / advertiser. Note: Until confirmed, rates are subject to change without notice.